Thank you for visiting our website! In the pages of this site you will find information on the UNESCO World Heritage Site of Gjirokastra, an outstanding example of an Ottoman merchant town and one of the few still surviving in the Balkans. This is also the website for the Gjirokastra Conservation and Development Organization (GCDO). For nearly ten years the GCDO has revitalized, protected and promoted cultural heritage in Gjirokastra. To learn more about GCDO's work in the community select this link About GCDO. Situated in southern Albania, Gjirokastra perches on the steep side of the Drino valley overlooking an historic landscape framed by snow-capped mountains. This ‘city of a thousand steps’ comprises hundreds of Ottoman-style tower houses with distinctive stone roofs, wooden balconies and whitewashed stone walls. Dominated by the sheer flanks of its vast castle, Gjirokastra is a magical city with a tumultuous past. From feudal stronghold to Ottoman jewel to Italian colony, the city has known many rulers and has inspired poets, authors and artists. 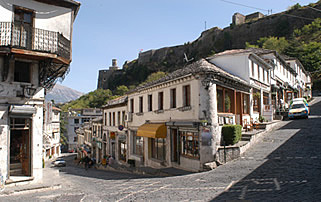 Known by many as the City of Stone, Gjirokastra is a developing centre for cultural heritage tourism. A walk around the network of cobbled streets that climb steeply out of the bazaar will transport you back in time. A visit to the vast 13th-century castle brings the adventurous tales of medieval rulers and communist atrocities alive. There is much to see in Gjirokastra and the surrounding areas, and a stay in bed and breakfast accommodation in one of the converted Ottoman houses can make an excellent base for exploring the region. We hope this website will provide all you need to be inspired to visit Gjirokastra.